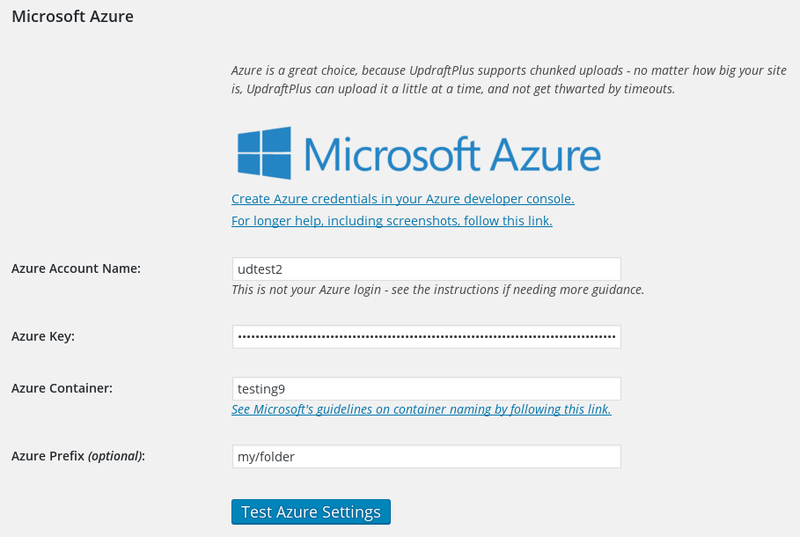 Support for Microsoft Azure (blob storage) is coming to UpdraftPlus Premium! Azure storage is basically Microsoft’s competitor product to Amazon S3 / Google Cloud Storage / Rackspace Cloud Files, for business/corporate storage (to be compared with Microsoft OneDrive, which is pitched at consumers, in competition with products like Google Drive and Dropbox). It’s fully supported – you can use with or without SSL (default is to use it), and uploads and downloads are chunked and resumable. The above screenshots are from our internal development version, in which Azure support is complete. Now we’re just working on testing, prior to the next UpdraftPlus Premium release. As ever, all current UpdraftPlus Premium customers will receive this as part of the next update.